With the beach just over the sand dunes directly behind the tent sites, safe swimming is literally on your doorstep at our Raglan Holiday Park. A good old-fashioned game of cricket or baseball on the beach for all the family or lounge about while the kids expend the energy. Pretty much exclusive to Raglan Holiday Park, ‘our’ beach is a great place to swim, launch your canoe, dingy or stand up paddle board or windsurfer. Kite surfing from here is also popular and will take you straight out into the waves of the harbour mouth. 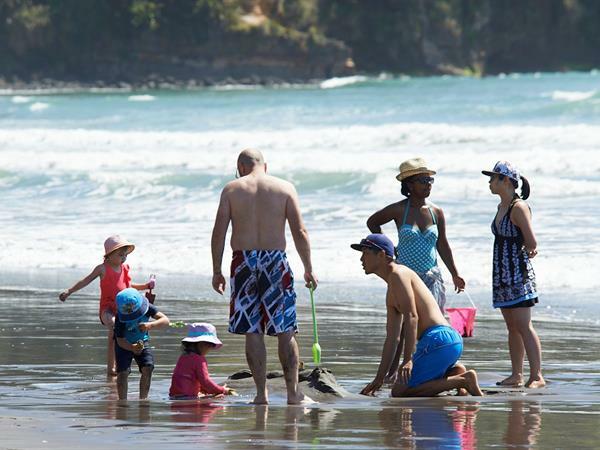 Raglan's main swimming beach is just a short drive from our Raglan camping ground, Ngarunui Beach is home to the Raglan Surf Life Saving Club. A beautiful west coast beach, it is renowned for being a great beach to learn to surf and to boogie board. And, check out the majestic stone carvings that greet you at the top lookout when you first arrive at Ngarunui Beach. Need assistance? Our friendly staff is more than happy to assist you with arranging and booking your Raglan activity. 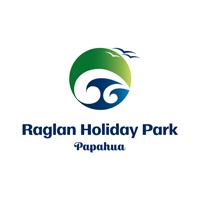 Click here for more information about your Raglan accommodation options at Raglan Holiday Park.